It’s National Poetry Month. Why April, you may ask? I did. Seems it was started when in 1996 some members of the Academy of American Poets gave away copies of T.S. Eliot’s The Waste Land outside of a New York post office. Canada NPMed two years later, making this the 20th annual celebration of April cruelty. I’ve celebrated by reading less poetry than I have since I started keeping track of my annual failure to read 95 Books in one year. I’ve followed Sandra Simonds on social media for a while. The other day she suggested to me on Goodreads that I might like her new collection Orlando and I thought that maybe I should read some of her already published stuff so I picked up Steal it Back and Further Problems with Pleasure, both of which, I should add, come with five-star reviews on Goodreads from Simonds herself. Who am I to argue? As it happens, I like both very much. Last fall one of my favourite people I’ve never actually met Sina Queyras AKA Lemon Hound released My Ariel, which Coach House described as “a poem-by-poem engagement with Sylvia Plath’s Ariel” so I decided that I should revisit Plath (whom I haven’t read since undergrad a lifetime ago) and also decided (since no one could have possibly thought of this before me) that I would read Plath and then the corresponding Queyras, which lasted all of three poems since Coach House are liars. Not to take anything away from Queyras; these poems are pretty great. These aren’t happy poems, but neither are the referral materials. Don’t call it a resolution but this year I wanted to at least try to once in a while be a bit social and over a quarter into 2018 I haven’t done a very well so I decided this week that I would join the Vancouver Running Co. Thursday night Flight Crew run which sets out at a very reasonable 6:15 p.m. from 1886 West 1st Avenue (which is a very reasonable 2.5 KM jog from my place), for a very reasonable 10 KM weekday evening run. Except that I got Translinked on Thursday and didn’t get home until 6:10 so I missed out. Except that I should have remembered from the two or three other times that I’ve ever joined a social run that social runs never start when they say that they are going to, as Strava let me know later Thursday evening that the Flight Crew took off closer to 6:30. So maybe next week. 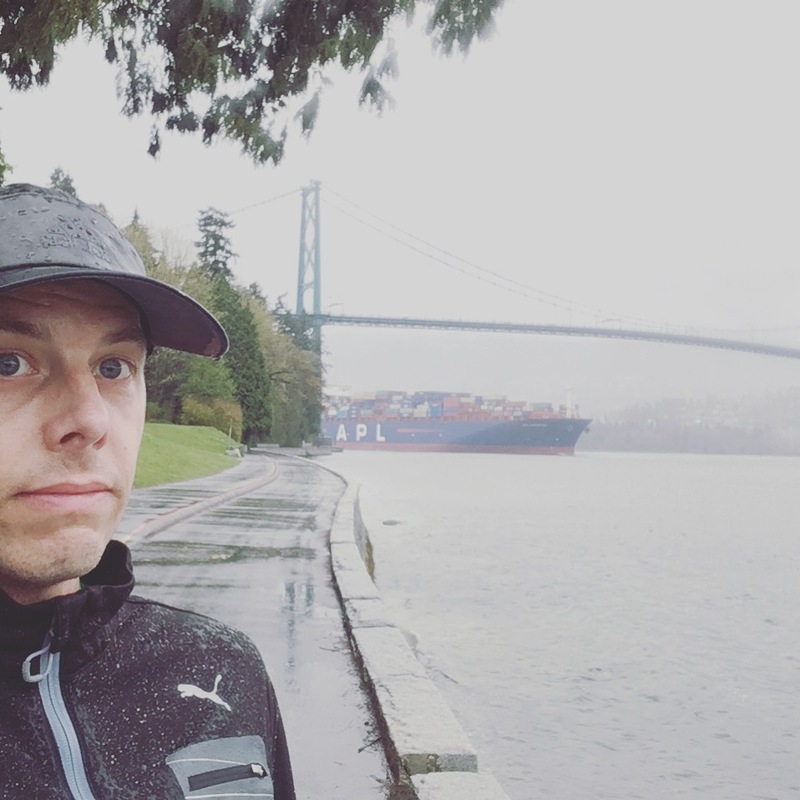 This week’s long run I did some reconnaissance on the second half of the BMO half and finished feeling very confident that I will new or near my PR on May 6. Less encouraging is that Garmin dropped for the second time in as many weeks. I believe in second chances, which is why I believe it may be time for a replacement.